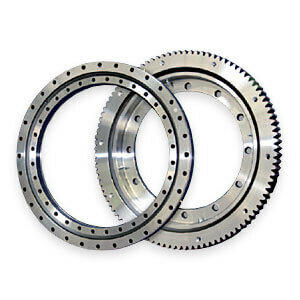 The rugged ball-bearing slewing rings from Isotech are characterized by their large diameter and large bores with only a small cross-section. They were designed for axial, radial as well as combined axial and radial loads. New design concepts and improved manufacturing processes for the ball-bearing slewing rings, enable our customer’s designers to implement completely new solution approaches. The bearings are very easy to assemble and demonstrate their properties particularly in small, sophisticated and high precision applications such as in the aerospace industry or in the special machinery area. The bore diameter of the Isotech ball-bearing slewing rings is at least 50 millimeters. The bearings are available with and without gear teeth, optionally in a corrosion-resistant or a customer specific tailor-made design.